Have a Nice Day is a stark, ruthless, and true-to-life movie about people living on the urban-rural fringe of China today. It’s no news that animation is a versatile medium capable of tackling the most serious topics, but Chinese director Jian Liu’s second animated feature Have a Nice Day (2017) is one of a kind. Visually and thematically, it is a stark, ruthless, and true-to-life movie about people living on the urban-rural fringe of China today. 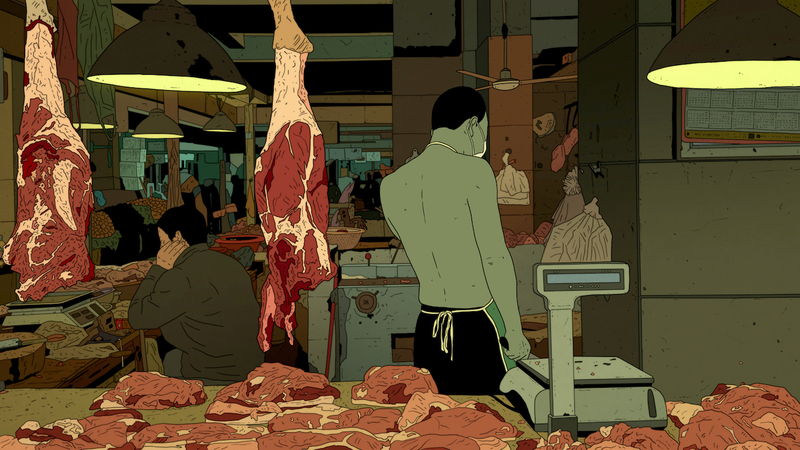 This Golden Bear-nominated film, although withdrawn from last year’s Annecy International Animated Film Festival due to “official pressures” by the Chinese government, is finally screening at Chinese and international theaters. Have a Nice Day is a dark comedy set over the course of a single day, forecast to rain, in an anonymous town of southern China. A bag containing one million renminbi is sought by a number of different parties who, within 24 hours, end up covered in blood. Through the diverse backgrounds of multiple protagonists we witness lives that, in reality, go otherwise unnoticed by many in a country undergoing transition. Have a Nice Day’s dark sense of humor and interlocking plots invite comparisons with Quentin Tarantino or Guy Ritchie films. However, instead of bloody, violent scenes, we are mostly shown a muted palette and detailed, almost photorealistic, backgrounds with a few flat, outlined figures in the foreground. The music by Shanghai Restoration Project tops it off by building a jazzy yet punky atmosphere. 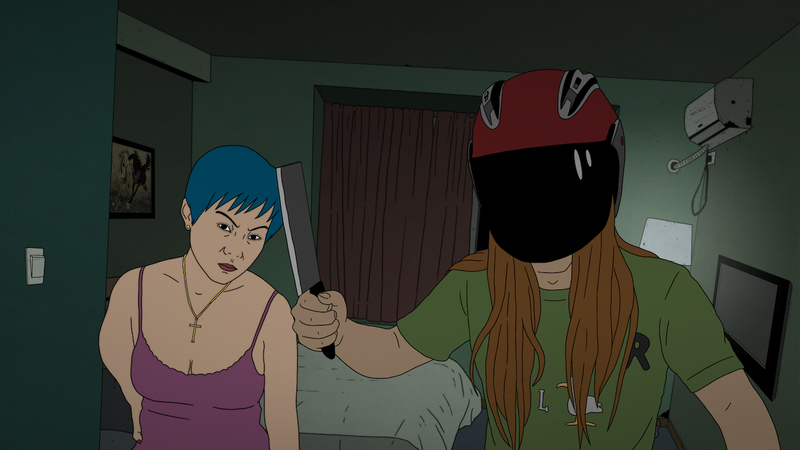 Have a Nice Day is a low-budget animation — the director worked with less than $1.5 million. But the minimalist approach to animation works; it focuses our attention on the witty dialogues and vividly rendered frames, each hand-drawn by Liu over the course of four years. And, if you look at the backgrounds closely — which reveal the mood of modern China— you’ll find crucial details to the storyline. Liu puts a magnifying glass where rural and urban China meet, where life is often caught between an established social hierarchy and new development. 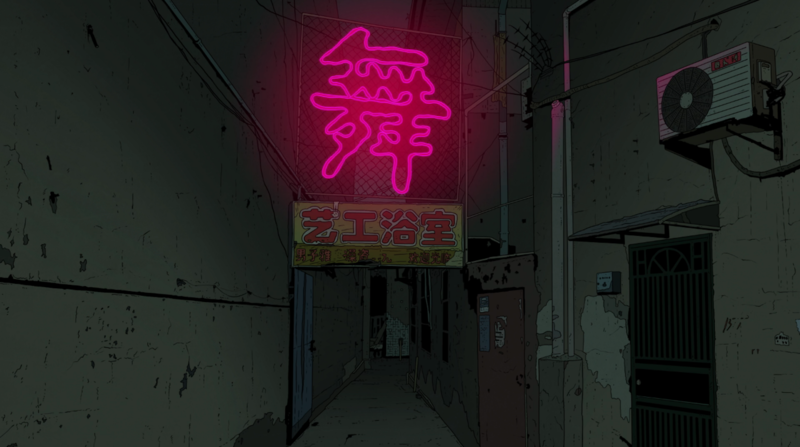 Various storefronts, commercial neon signs, and slogans painted on the wall invoke a well-off, international lifestyle of a globalized world with a bright future. But the visual contrast between the flat characters and richly textured backgrounds illustrates how the protagonists live separately from this illusion. As the movie proceeds, we see that their lives, struggles, and aspirations are still depressingly limited to the status they were born into. The protagonists all suffer from economic frustration, allured by the promises of capitalists and spending money on things like failed plastic surgeries. In recent years, Chinese culture has often described the rural-urban fringe as “magical,” in the sense of “magical realism.” Stuck in between rapid modernization and fixed social strata, these areas are often paradoxical. As the director said, “What some might call surrealism is often the reality there.” Hence the movie, tinted with grim realism, is sometimes interrupted by poetic and even absurd surrealism, such as two-minute live-action footage of waves, or a kitschy music video of “Shangri-la” that remixes Mao-era propaganda posters with American Pop art. Even though Have a Nice Day tells a very regional story, its focus is on money — the object of desire under ruling capitalism. 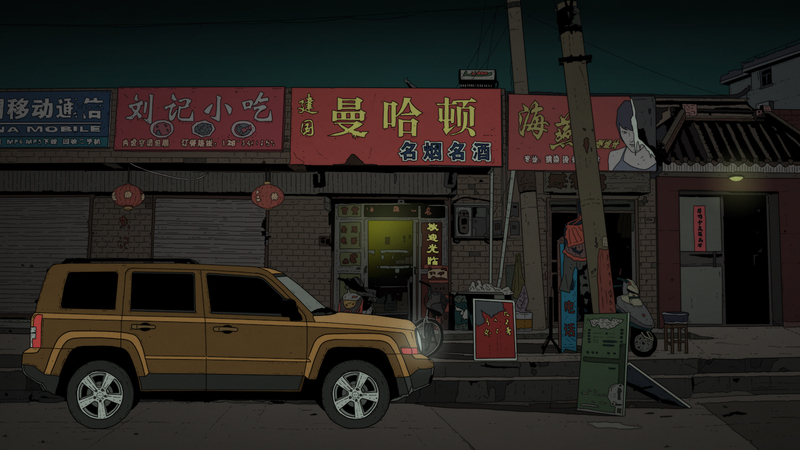 At one point, a side character, voiced by Liu himself, outlines three levels of freedom: “farmers market freedom,” “supermarket freedom,” and “online shopping freedom. Living on the edges of cities, these residents are obsessed with the idea of social mobility and “freedom,” a concept imported from and promoted by the world’s largest capitalist economies. But, in the end, the movie makes clear, this freedom is nothing more than a bag of renminbi washed away by the pouring rain. Have a Nice Day by Jian Liu premieres at the Angelika Film Center (18 West Houston Street, Greenwich Village, Manhattan) on Friday, January 26.